In an interesting twist to this story, however, the court did not throw out the conviction of the man who had appealed his case based on the Fourth Amendment principle. The justices said that, since the officer was following the law as it was understood at that time, his conviction would stand. Arizona’s law currently suspends drivers for a year or longer if they refuse to submit to breathalyzer test. Over the past year, defense attorneys in several states have been hammering away at the breathalyzer requirement, successfully using the Fourth Amendment argument when presenting cases to their states’ highest courts. A U.S. Supreme Court ruling, expected some time before June, could offer the definitive word on this matter. Like many states, California currently has an “implied consent” law (Vehicle Code 23612) that requires drivers pulled over for DUI to submit to a BAC test. If they don’t cooperate, they lose their license for one year and spend 48 hours in jail for a first DUI offense. They’ll face a two-year suspension and four days in jail for a second offense and a three-year suspension and 10 days in jail for a third offense. 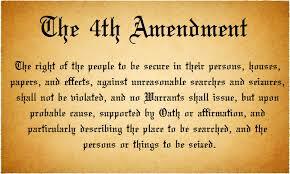 Do you believe that police violated your Fourth Amendment rights? Call the experienced Los Angeles DUI defense attorneys at the Kraut Law Group for insight into your case.